Hi all, are you ready for Independence Day? It's soon upon us. I am not even the slightest bit prepared. But I do have a fun recipe for the holiday! 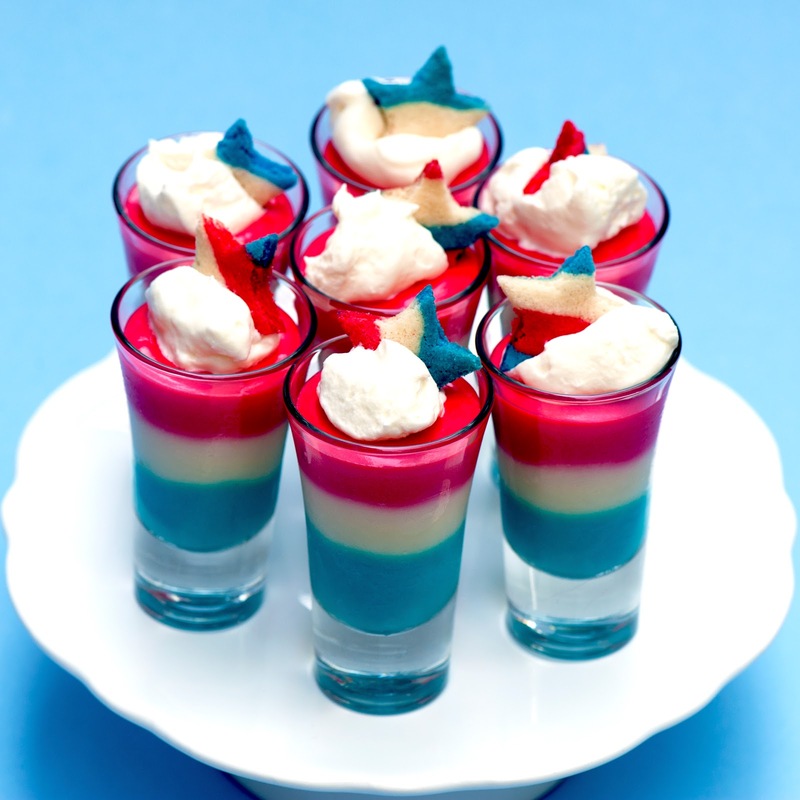 These Sugar Cookie Pudding Shots are not only patriotic - they are also creamy, and tiny and just darn good - the amaretto gives them just the right cookie-ish flavor. And yes, I'm a sucker for a pudding shot - with the tiniest edge of alcohol-taste (otherwise I would just eat a pudding cup). If you prefer lower octane, swap out 1/4 cup of the vodka for more milk. And yes, its been several million years since my last post. Count your lucky stars (pun intended) that this is a blog about jellies and alcohol-infused shenanigans, rather than my life, which these days is prime fodder for a B-movie, cautionary after-school special or a Lifetime network miniseries, but little else. It's been just about everything,FEMA-style. I'm just waiting for the locusts to show up. I should mention also that this post is sponsored by our lovely new friends at Sobieski Vodka. We used their vanilla vodka in the following recipe. Sobieski sent two giant boxes of booze to try out (as well as groovy swag) so you'll be seeing their name. I'm quite impressed with Sobieski's flavored vodkas overall - the price point is ridiculous (in a good, low, highly affordable way), and it's good vodka. Meeting adjourned. Happy Fourth. And talk soon. Add the vodka, a 1/4 cup at a time, combining completely before each new addition. Stir in the amaretto and the whip. Divide the pudding mixture equally into 3 bowls. Tint two of the bowls with the red and blue food coloring, until the pudding reaches the desired vibrancy. For me, it only took 4 drops of neon blue, but about 20 red. Layer the colored puddings in tiny shot glasses or other recepticals, as desired. I used these shot glasses from Libby. Click here for the recipe for the cute little patriotic star cookies. I couldn’t resist using them. They are so cute. The recipe will make several million tiny stars – so you’ll probably want to use only one tube of cookie dough and a wee little pan!